Most, if not all, of you may have heard about one of the latest health crazes. Being “Gluten Free.” I know a lot of people scoff at it, and several people jump to crazy conclusions about it. 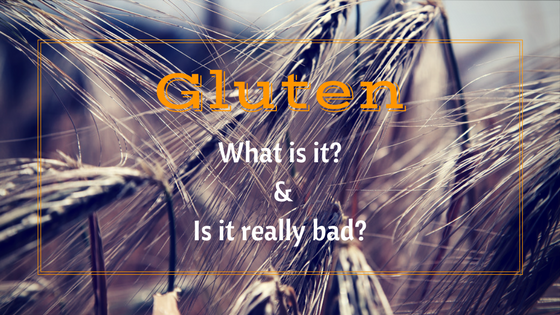 However, how many of you know just what gluten is? Someone asked me a question the other day, about gluten. She asked “if there's already so many bad things in our food, why do they have to add in gluten?” For a minute I didn't know what to say. She apparently had a very wrong notion of what gluten really is. She's not alone in her misconceptions either. Quite a few people misunderstand what gluten really is, even people who are on a gluten free diet. This is so prevalent that Hollywood also makes a point of acknowledging it. Musician Tom Waits was interviewed by David Letterman in 2015. In this interview Mr. Waits talks about his appearance at a political rally to “Free the Glutens” and how they've “never had a country of their own.” Several comedians have been known to feature gluten misconceptions in their acts/movies as well. With all the misconceptions going around, I figured that I would try and clear things up a bit. Simply stated, gluten is a family of proteins naturally found in wheat, rye, barley, and several other grains. The two main proteins found in this family are glutenin and gliadin. Gliadin is the protein most responsible for the negative health effects. When flour is mixed with water, gluten proteins form a sticky, glue-like, substance that acts like a web, holding the mixture together. This is what gives dough the ability to rise and to be shaped by rolling, kneading, and braiding. Without gluten, dough would just be a wet mess until it was baked. It also provides a good, chewy, texture once the bread is baked. Gluten is not necessarily bad for everyone. However, there are a number of people who are either allergic or sensitive to gluten. Why is this becoming so popular now when bread and grains have been a staple of the human diet for centuries? There are quite a few theories out there, but none of the scientific research done so far can point to a specific reason. One theory that I think has merit is all about how we grow and process our grains today. Hundreds of years ago, we grew our crops naturally and seasonally. We hybridized our grains using natural techniques, in order to ensure better harvests and sometimes better taste. We then harvested these crops and processed them minimally with all natural ingredients. There were no artificial flavors, dyes, or preservatives added. There were no “frankingrains” created in a lab. It was just all natural, hand made, tasty goodness. However, in modern times, it's almost impossible to find grains that are natural, to that extent at least. Also, wheat and other gluten-filled grains are used as filler in quite a few of products that you would not expect. As we are becoming more and more inundated with the over-processed grains, allergies and sensitivities are becoming more and more prevalent. Celiac disease is an autoimmune disorder that damages the small intestine. It's triggered by gluten consumption and has become quite common in recent years. According to the National Institute of Diabetes, Digestive, and Kidney Diseases (NIDDK), celiac diseases affects 1 in 133 people in the US. Around the world, it's 1 in 200. It's much more prevalent in cultures that consume more wheat. In celiac patients, gluten consumption triggers an autoimmune response that attacks the villi in the small intestine. The villi are finger-like projections that are responsible for nutrient absorption. Over time, in celiac patients, the villi become flattened and malnutrition can occur. Because malnutrition is the major symptom, it affects the whole body and can go undiagnosed for years. 1 in 7 people are gluten sensitive, but do not test positive for celiac disease. These people are considered gluten intolerant or Non-Celiac Gluten Sensative (NCGS). This is much more likely to occur in people of Anglo-Saxon or European descent. Many of these people can avoid gluten for an amount of time and slowly reintroduce it back into their diets without any ill effects. The NIDDK suggests that for children the period of time is between 3 and 6 months while for adults it can take several years. There are some people with NCGS that have permanent intestinal damage, however, and must avoid gluten for the rest of their lives. You can find lists of symptoms as well as foods to avoid all over the web, so I won't post them here. However you should talk to your doctor about gluten if you believe it might be affecting your health. I hope I have cleared up some of the questions you might have about gluten. If you have any questions or comments please leave them below.